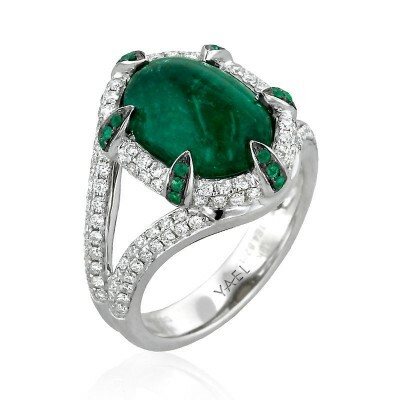 This regal design centers an oval-shaped emerald cabochon gripped by heavy prongs set with additional emeralds. The prongs are plated with black rhodium, contrasting with the curving double halo and to emphasising the dramatic jardin within the emerald. A split shank with double rows of diamonds coordinates with the modified halo.